Costume creation, up close and personal. 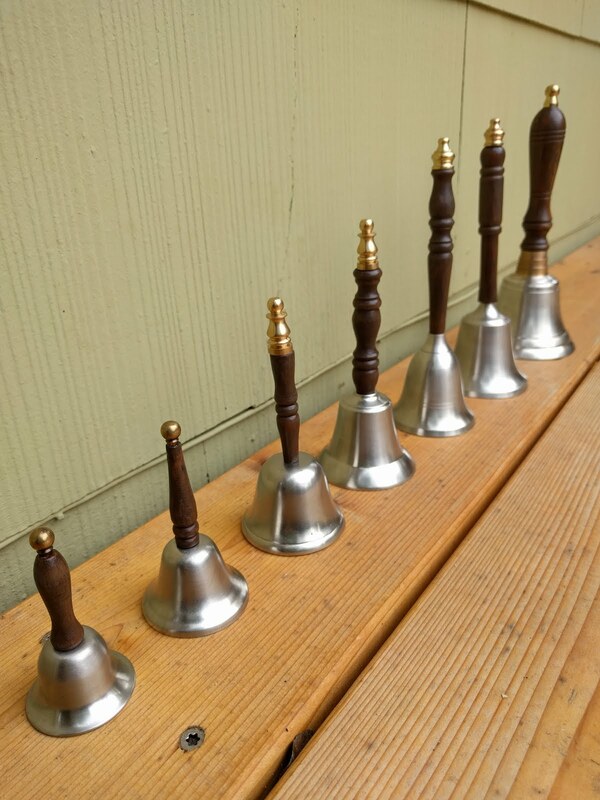 The first step was acquiring the bells. I purchased the majority of them on Etsy from someone's collection of vintage bells. Not appearing in the final cosplay, that terrifying clown handle in the middle of the row. 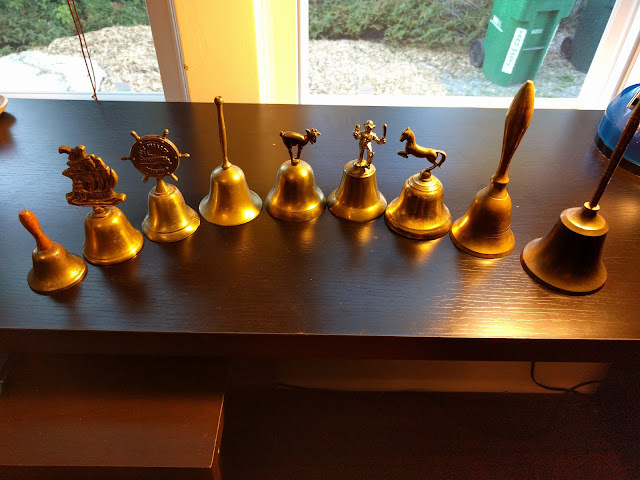 I ended up choosing five of them for the mid-size bells, and had to purchase an additional larger bell from Amazon. The smallest bell I made from the end of a candle-snuffer. Yucky metal water is yucky. 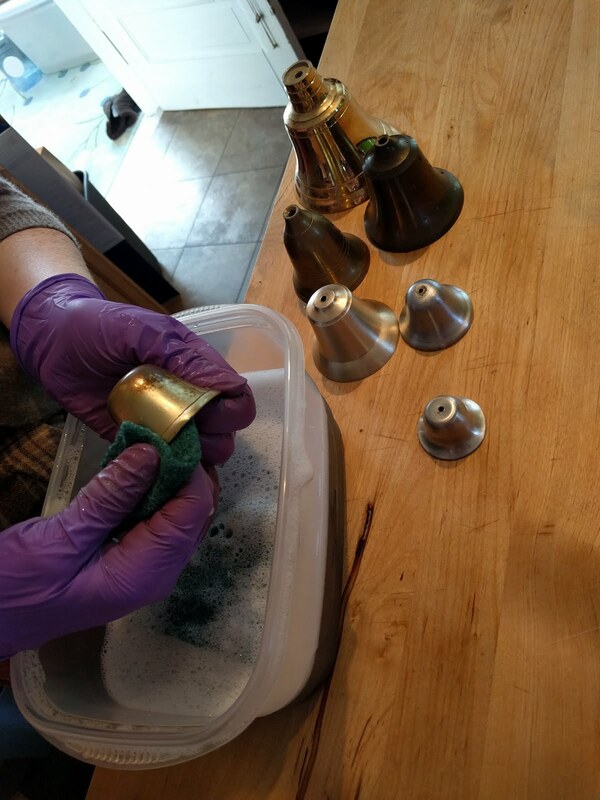 ...until I finally had some nice clean bells! 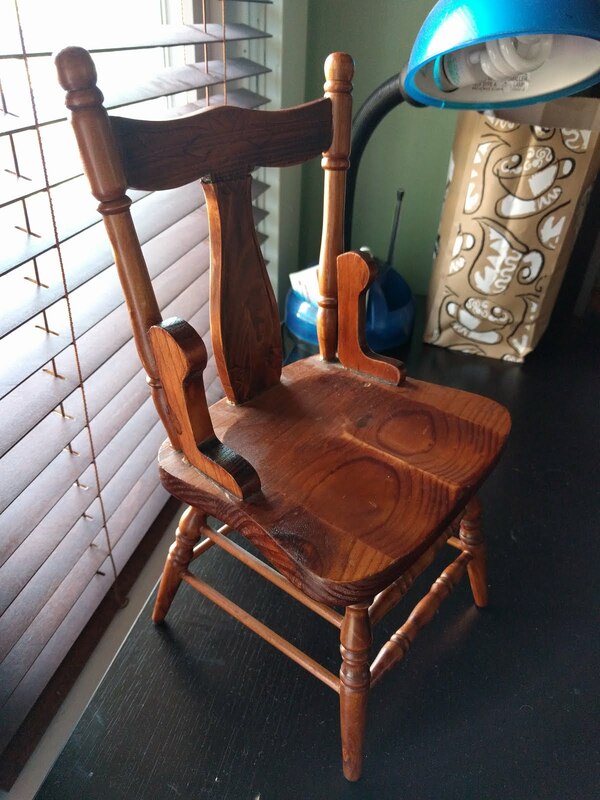 I quite unceremoniously tore apart the tiny chair for its various parts, resulting in a pretty good basis for some handles. Sabriel's bells are explicitly stated as being silver; a necromancer's bells might be other colors, but not the Abhorsen's! This meant I had to find some way of changing the color. If you are looking to budget your money/time/effort/sanity, at this point I would recommend finding the best silver paint you can and proceed with that. 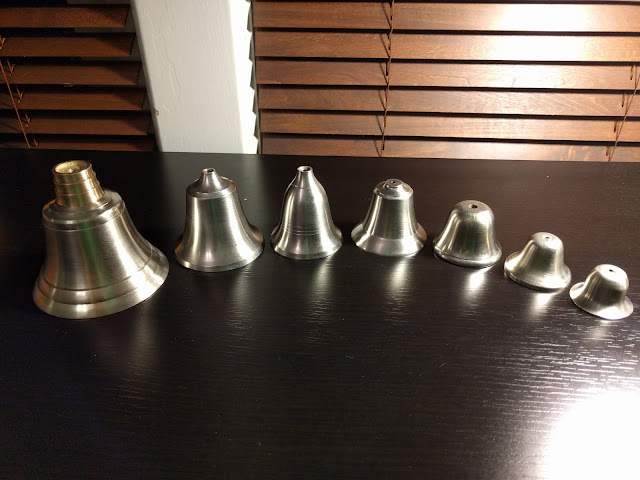 If you're looking to lose money/time/effort/sanity but gain an interesting new skill, you can do what I did, and electro-plate them with nickel. I love metalworking and feel that there's a luminous, bright quality to true metal that paint can't quite capture, so going the extra mile on the bells was very important to me. 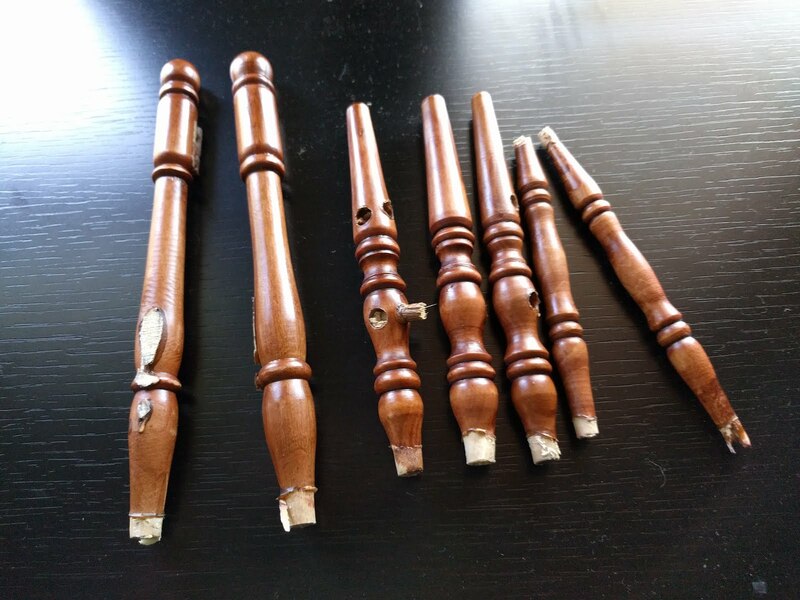 Pictured: not the ideal way to do this. 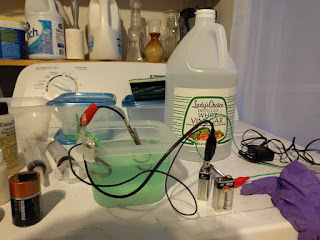 To start plating, you have to make a solution of nickel acetate by running a current through two pieces of nickel in vinegar (I used pure nickel wire, but a solid piece of nickel would be better, since the wire degraded quickly.) I started using 9V lantern batteries, but this takes forever. I soon graduated to making my own power source out of an old phone charger, a fuse box, and some alligator clips, which was much more successful. Once the solution is saturated with nickel, it's time to plate! 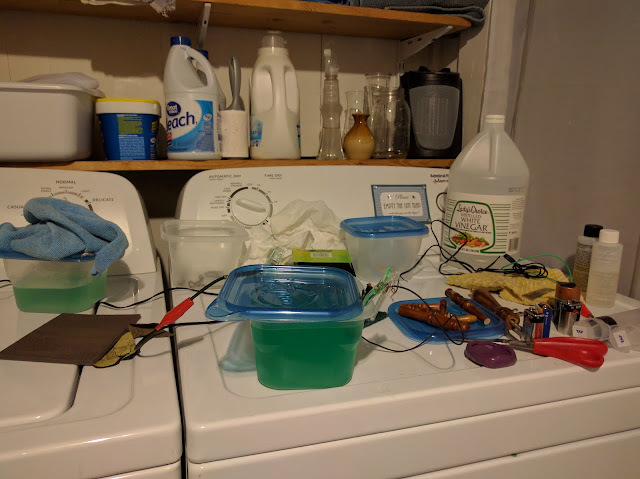 Ideally, you connect your bell to the negative wire and the nickel source to the positive wire and dunk them both in the solution to complete the circuit. This draws the nickel onto the surface of the bell. 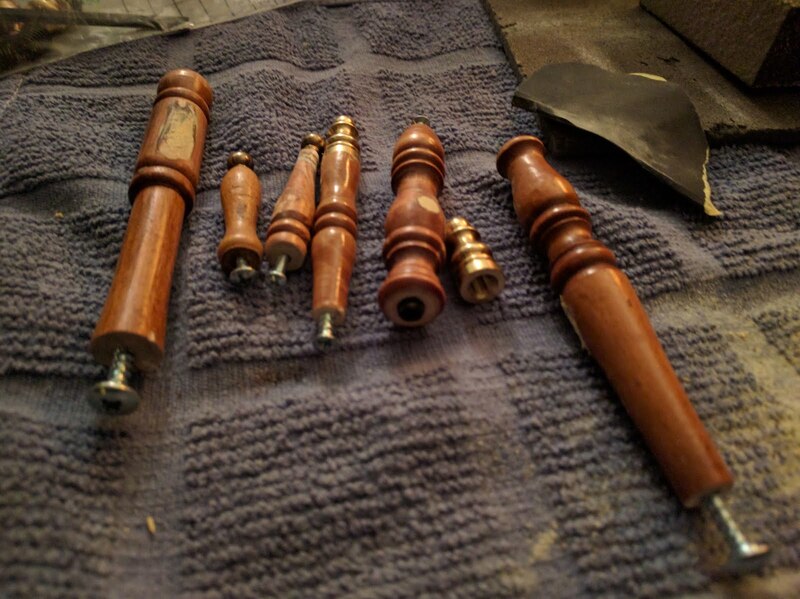 Of course, things were not ideal, so this whole process took me about three weeks to get right. 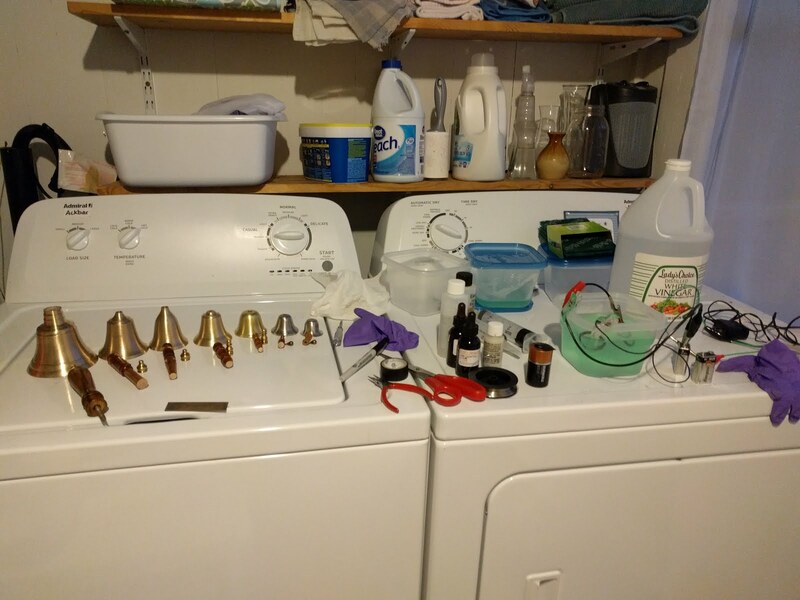 First the solution was too weak, then the bells weren't clean enough, then the current was wrong, then I had to agitate the whole mixture... It was definitely a learning experience. 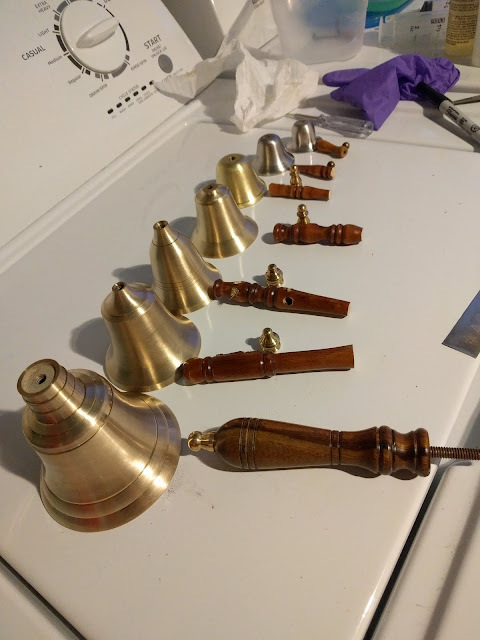 With the bells complete at last, I went back to working on the handles. I filled the holes with wood filler, sanded it down, and drilled holes in both ends: one for the screw to hold the bells together, and one for the grub screws that the finials would be attached to. For a functional prop like this, which might see wear-and-tear, I had a strict no-glue policy. 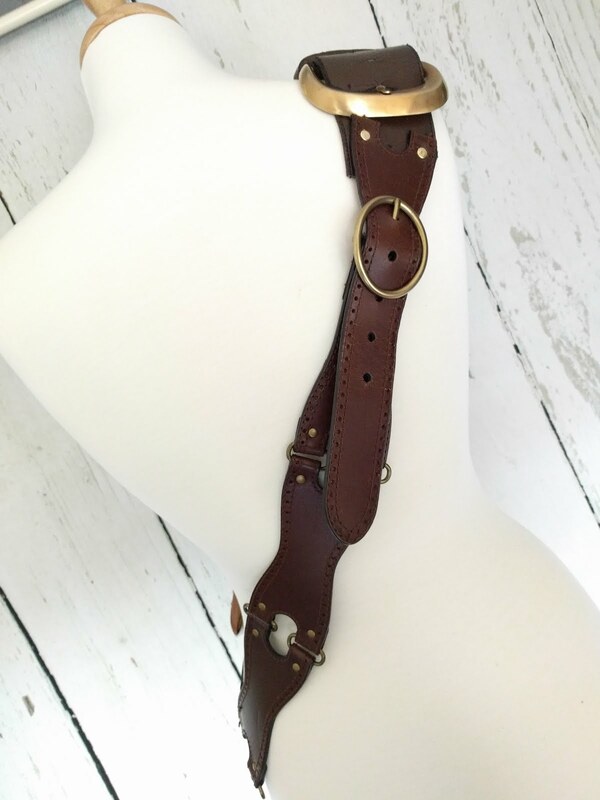 The next step (and by far the most frustrating one) was building a bandolier to house them. 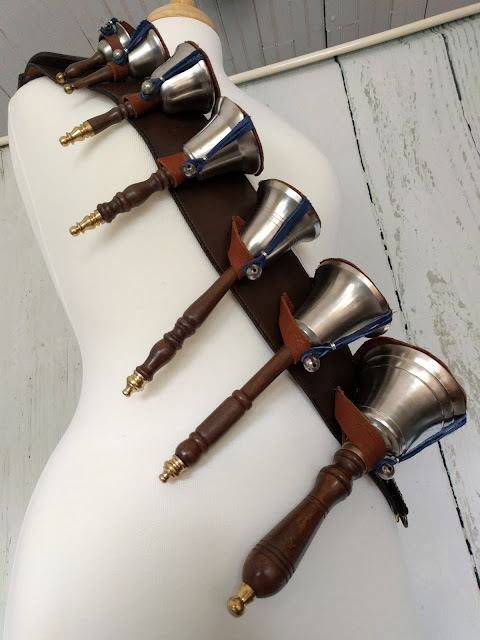 This was a last-minute, night-before-the-con project, and I was very worried that all the work I had put into the bells would be wasted because I couldn't get the holder right. 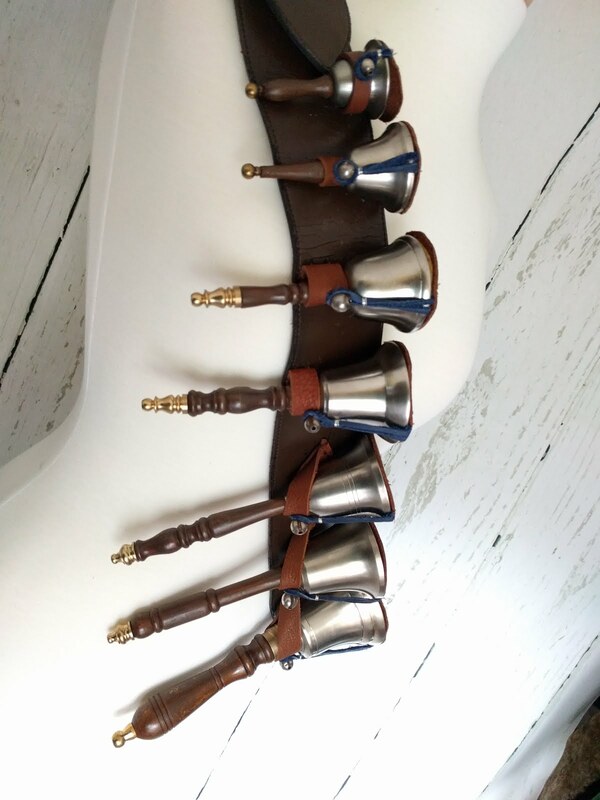 Although Sabriel's bandolier is describe as having full pouches, I really wanted the bells to show. 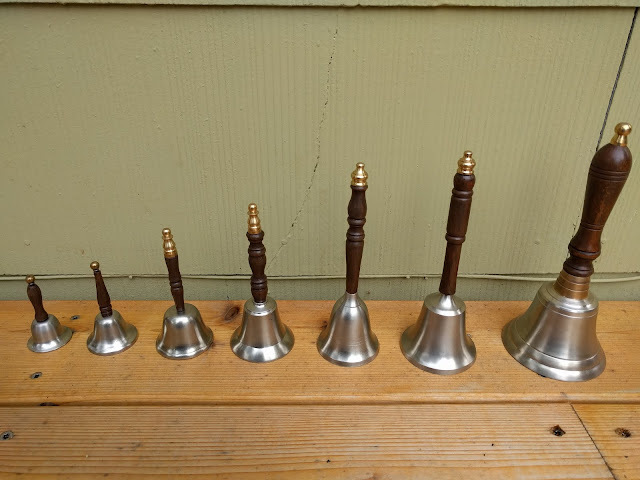 The difficulty was building a system that both displayed and supported the bells, while still allowing the user to easily remove and replace them. Two belts from Goodwill, a bag of leather scraps, and a lot of grueling leather-sewing later, I had a complete bandolier! Best of luck with all your cosplay endeavors, and thanks for reading! This is a fantastic tutorial! I never knew you could plate something with metal at home. 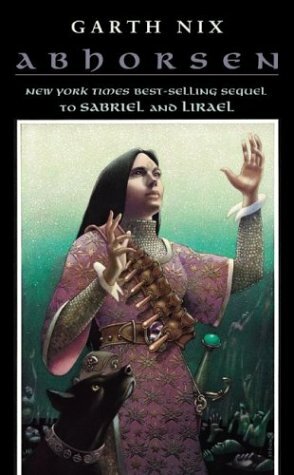 I hope to someday cosplay Sabriel, but I'll be going the paint route, I think, haha! 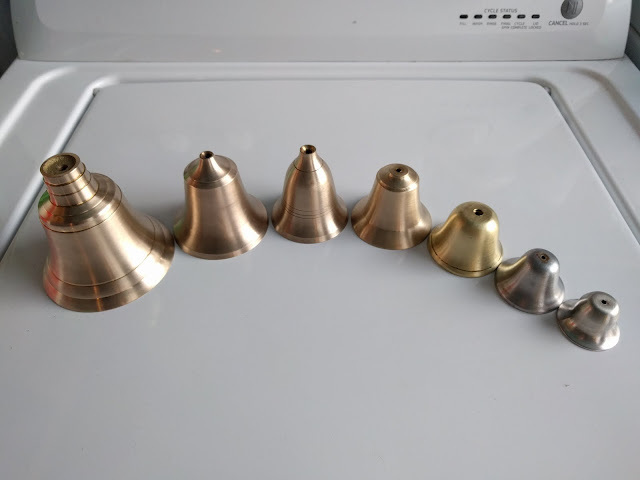 Thank you for walking us through your process, your bells turned out gorgeous! You're so welcome, and thank you as well! I'm curious what the bells sound like :o Do you have a video of them in action? 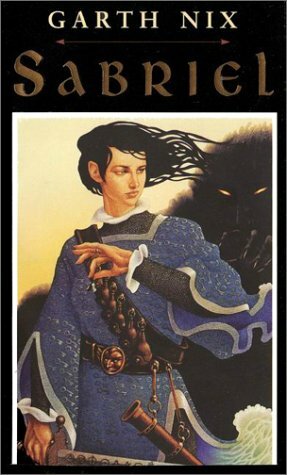 So I love the Abhorsen series and tried to get my middle school students to read it. 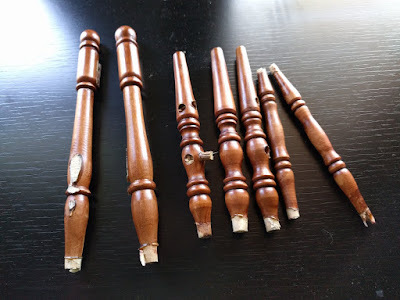 I was a wee bit successful. That was when I was a middle school librarian. I am retired. But, a few years ago I was at the Texas Renaissance Festival. It was near the end of the day and I'd left my phone in my bag when I went into the ladies. As I was leaving, a girl came in dressed as Sabriel. I stopped dead and said, "Abhorsen? From the series?" She smiled and said yes. 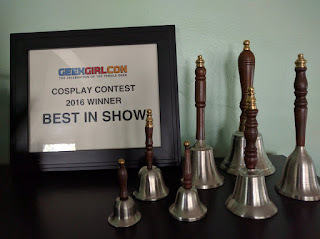 I replied, "That is a fabulous costume with an awesome set of bell." 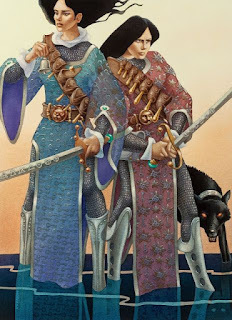 Her bandolier was terrific and she was wearing a lovely blue and gold key surcoat. I didn't think I should run to get my phone. I really regret not doing it. 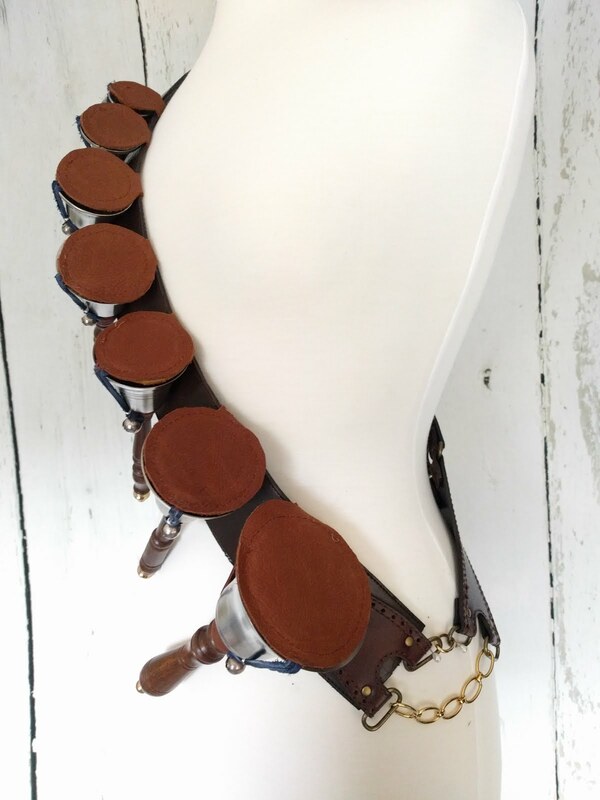 Ginger Armadillo Costumes wants to help you make your cosplay dreams come true! 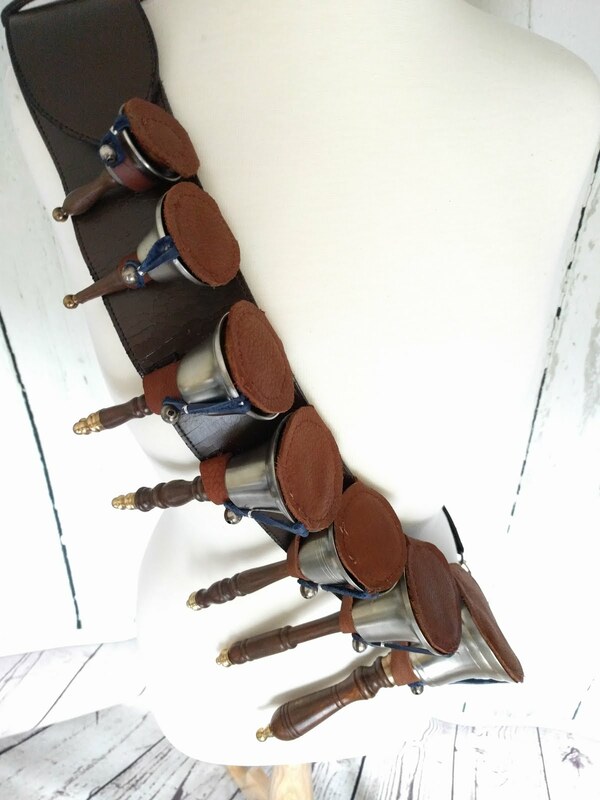 (c) Ginger Armadillo Costumes. Watermark theme. Powered by Blogger.